Hong Kong’s CHP (Centre for Health Protection) was created after the shellacking that city took from the SARS outbreak of 2003 (see SARS and Remembrance). Since then, the CHP has become the very model of a modern, proactive and diligent public health system. Over the years we’ve watched Hong Kong deal effectively with intrusions from H7N9, H9N2, H5N1 and a variety of other imported infectious diseases, all whilst keeping the public – and outside public health interests – well informed along the way. With more than 7 million residents crammed into just 426 sq miles, the CHP takes infectious disease threats very seriously. Today, Hong Kong’s CHP unveiled their MERS-CoV Preparedness Plan – one that is based in large measure on their Preparedness Plan for Influenza Pandemic launched in 2012 (see Hong Kong Updates Their Pandemic Preparedness Plan). 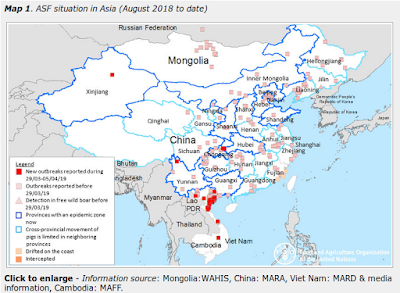 confirmation of sporadic or clusters of human case(s) caused by MERS coronavirus in areas outside Hong Kong, which the transmissibility to human has not been sufficient to sustain community level outbreaks. with Hong Kong and with evidence of human-to-human transmission sufficient to cause sustained community level outbreaks. This 23 page PDF document outlines in detail the individual response steps mandated for each of these three scenarios. The Government today (June 12) announced the launch of the Preparedness Plan for Middle East Respiratory Syndrome (MERS Plan). The Plan sets out the Hong Kong Special Administrative Region Government's preparedness and response plan in case of an outbreak of MERS, and is mainly based on the framework of the Preparedness Plan for Influenza Pandemic launched in 2012 (Influenza Plan 2012). In the MERS Plan, a three-tier response level, namely, Alert, Serious and Emergency, is used, which is in line with the Influenza Plan 2012. The MERS Plan also includes comprehensive response measures, clear command structures, and mechanisms for the activation and standing down of response levels. In accordance with the MERS Plan, the Alert Response Level is activated with reference to the current epidemiological situation. The MERS Plan has been uploaded to the CHP's MERS page (www.chp.gov.hk/en/view_content/26511.html). Recent scientific studies supported the premise that camels served as the primary source of MERS Coronavirus (MERS-CoV) infecting humans. The virus appears to pass from an infected person to another in close contact as observed among family members, patients and health-care workers (HCWs). However, so far there is no evidence of sustained human-to-human transmission in the community. Currently, there is no vaccine against MERS available. Treatment is mainly supportive and there is no effective antiviral treatment recommended for MERS at the moment. "As the summer vacation is just round the corner, we strongly advise travel agents organising tours to the Middle East not to arrange camel rides and activities involving camel contact, which may increase the risk of infection. Furthermore, travellers are reminded to avoid going to farms, barns or markets with camels, and avoid contact with animals (especially camels), birds, poultry or sick people during travel," the spokesman added. (www.travelhealth.gov.hk/english/popup/popup.html) or the WHO's latest news (www.who.int/csr/don/archive/disease/coronavirus_infections/en/) for more information and health advice.